THE STORY: Indonesia's President-elect Susilo Bambang Yudhoyono said he might have to introduce tougher laws to tackle terrorists who still pose a grave threat to his country. Dr Yudhoyono, who is due to be sworn in as president today, said in an interview with Singapore's Straits Times newspaper, dealing with terrorism would be his top priority. I DON'T BLAME HIM! "We still face the grave threat of terrorist attacks," he told the newspaper. "I will take all necessary measures to make sure that Indonesia does not fall victim to another attack." STORY: Dr Yudhoyono was swept to power as the country's first directly elected president on promises of faster job growth and action against Islamic militancy. 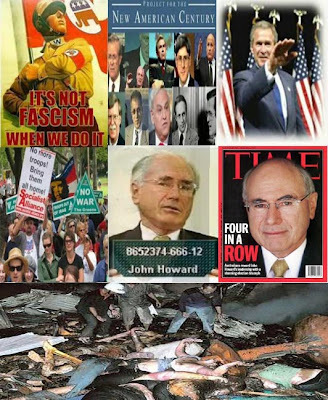 More than 200 people, many of them foreigners, have been killed in, [false flag, calle to arms], bomb attacks in Indonesia over the past two years, including blasts on the tourist island of Bali in October 2002 and an attack on the Australian embassy in Jakarta last month. He said his government would draw up comprehensive measures, including boosting the effectiveness of security agencies and reviewing laws in the fight on militancy. "The problem for us so far has been the difficulty in detaining suspected terrorists indefinitely. Tougher laws can help us deter acts of terrorism and it is something I will have to review," the former general said. Indonesia enacted anti-terror laws soon after the Bali bombings. They allow for the death sentence and give police the power to use intelligence data to detain suspects for six months without trial. Problem: False Flags, State Sanctioned Terror Created by the Government. Solution: Draconian Laws for the People. Indonesia is the world's most populous Muslim country. The majority of people follow a moderate form of Islam.